At first glance, this jacket looks more fashion than function, but it’s actually the other way around. The shell, which is made of Supratech 400D oxford nylon, is waterproof, breathable and coated with a Teflon protective finish, which makes it more durable and softer to the touch. On the inside is 450-gram Northern fleece that has been quilted to a 200-gram feather-touch polyfill, a combination that gives the jacket a thermal factor of 650 grams. Plus, the sleeves and chest of the jacket are lined with a Technoloft dual polyfill system, featuring DuPont Thermolite Micro—so you know that you’ll stay warm in it. 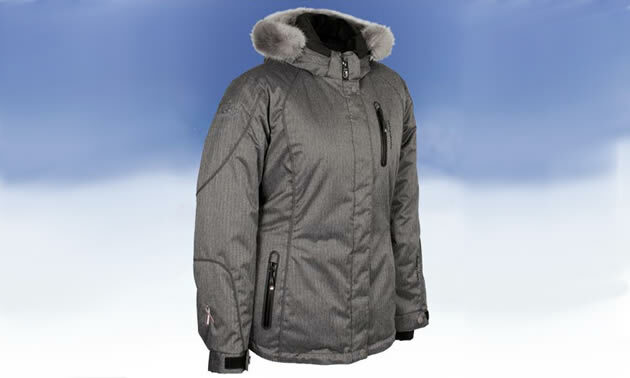 Functional features of the jacket include: reflective trim for increased safety; YKK zippers; a dual storm flap; a Northern Fleece-lined adjustable collar with a knit backdraft protector; shaped sleeves with elasticized cuffs and Velcro adjustments; an adjustable elasticized wind-stopper cord with pulleys at the hips; an adjustable wind-guard cummerbund that is detachable; and a faux fur trimmed hood that is also detachable. If this jacket catches your eye, you may also be interested to know that if you buy it, Choko Design will make a donation to the Kelly Shires & Pink Ribbon Riders Breast Cancer Foundation. It is part of the company’s Choko Cares Campaign.